PHOENIX and TAMPA, Fla., April 11, 2019 /PRNewswire/ -- WellCare Health Plans, Inc. (NYSE: WCG) (WellCare) announced today that Care1st Health Plan Arizona's Care1st Avondale Resource Center, in partnership with the City of Avondale and First Things First (FTF), is commemorating its 10-year anniversary and continued commitment to serving vulnerable communities in Southwest Maricopa County through cross-sector collaborative successes. During the Great Recession, which impacted many families across the metro-Phoenix area, Care1st Health Plan Arizona and the City of Avondale sought to find an innovative solution to tackle the lack of easily accessible human services in the Southwest Valley. Apart from the direct services provided by the City of Avondale, individuals seeking assistance at the time had to turn to providers located in central Phoenix or the East Valley. Both the City of Avondale and Care1st Health Plan Arizona understood the growing need for human services in the Southwest Valley, an underserved region of Maricopa County and seized the opportunity to find a solution that would benefit not only members in the area, but also the community as a whole. In April 2009, the Care1st Avondale Resource Center launched in historic Avondale, Ariz. through an innovative public-private partnership between Care1st Health Plan Arizona, the City of Avondale and FTF. The center is a one-stop hub of social and human services including healthcare enrollment, Women, Infants, and Children (WIC), parenting classes, financial literacy workshops, job assistance and more. Much of the Care1st Avondale Resource Center's success is due to the extraordinary commitment of its core partners. Care1st Health Plan Arizona provides annual operational costs and staff to support the center's day-to-day needs. The City of Avondale maintains the facility and manages operations and staff. FTF, a voter-initiated, statewide organization, provides funding to community-based organizations that support early childhood education and health. Many of the community-based organizations housed within the center receive FTF grants, which are critical to their continued growth. Most recently, the WellCare Community Foundation donated $230,000 to support the opening of a new Bayless Integrated Healthcare clinic located in the Avondale Elementary School District (AESD). This multi-specialty clinic provides integrated healthcare services including family medicine, behavioral health and life skill services to students, families and individuals in the Southwest Valley. Additionally, the Care1st Avondale Resource Center collaborates with the Bayless Integrated Healthcare Clinic, which is conveniently located across the street, to connect patients to services and resources. In 2014, the Maricopa Association of Governments (MAG) recognized the center with the "Desert Peaks Award" for providing outstanding services to the community. 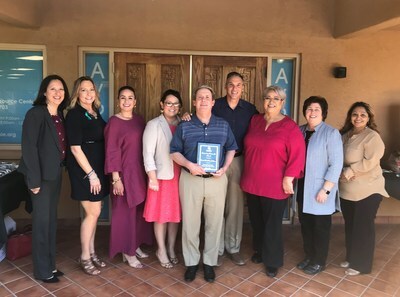 Similarly, WESTMARC honored the center with the "Best of the West Award" in 2010 for improving the quality of life of residents in the West Valley. "The Care1st Avondale Resource Center has reached an exciting milestone," said Scott Cummings, state president, Care1st Health Plan Arizona. "The center has been a staple in the community for the past 10 years and it'll continue to offer holistic services and resources to help improve the health and wellbeing of those we serve." "As an organization whose core purpose is committed to making lives better, we're honored to serve the residents of the City of Avondale and the Southwest Valley," said Mayor Kenn Weise, City of Avondale. "We're dedicated to ensuring that the Care1st Avondale Resource Center continues to be a safe haven for local families and offers opportunities for growth and self-reliance." As part of this commitment, the Avondale City Council has approved funding to design and build a new facility to house the Care1st Avondale Resource Center and support its growth. The new building is expected to be under construction in 2020, and will bear the name of former Avondale Mayor, Marie Lopez Rogers, to honor her legacy of support to health and human services. "We greatly appreciate the impact we've been able to make in the lives of children birth to age five over the past 10 years with our partners, Care1st Health Plan Arizona and the City of Avondale," said Annette Bourne, regional director of the FTF Southwest Maricopa Region. "By providing high quality early childhood services at the Care1st Avondale Resource Center, we can support a well-rounded and healthy quality of life for Arizona's youngest children." On April 10, Care1st Health Plan Arizona, the City of Avondale and FTF came together for a 10-year-anniversary celebration featuring refreshments and remarks made by organization leaders and community partners who acknowledged the Care1st Avondale Resource Center's positive contributions to the community. As of Dec. 31, 2018, Care1st Health Plan Arizona serves approximately 186,000 Medicaid members and 2,000 Medicare Advantage members in Arizona. WellCare Health Plans also has 19,000 Medicare Prescription Drug Plan (PDP) members in the state. Located just west of Phoenix, Avondale, Arizona is a fast-growing community of 84,000 residents, who represent a broad spectrum of cultures and share a true sense of harmony throughout the community. Here, people and businesses are welcomed with open arms and supported in a way that exemplifies a dynamic, intelligent and driven city, ready to take on the future. Avondale is Aspiring, Achieving, Accelerating. www.avondaleaz.gov.